All transactions are safe and secure with a reliable history in online purchasing behind each of our associates. Buy the Texas Chainsaw Massacre Eyes t-shirt to own Texas Chainsaw Massacre clothing and merchandise. The fronts of these Texas Chainsaw Massacre t-shirts feature the eyes of Sally Hardesty as she watches the horror caused by Leatherface and his saw. Wear it so that everyone knows that you're ready to outrun and outlive the psychotic chainsaw wielding killer Leatherface. He's the guy who makes his own friends out of pieces of yours. The merchandise item on the left is perfect to wear underneath Texas Chainsaw Massacre costumes and similar dark sweatshirts. 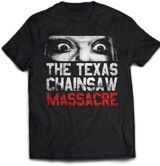 In addition to the Texas Chainsaw Massacre Eyes tee above, browse the Texas Chainsaw Massacre Clothing Gallery for more apparel like men's and women's clothes, kids shirts or hoodies.